THIS ITEM CAN NOT BE USED WHEN GROUND CONDITIONS ARE WET. THE BELTS SLIP AND IT DOES NOT FUNCTION PROPERLY. 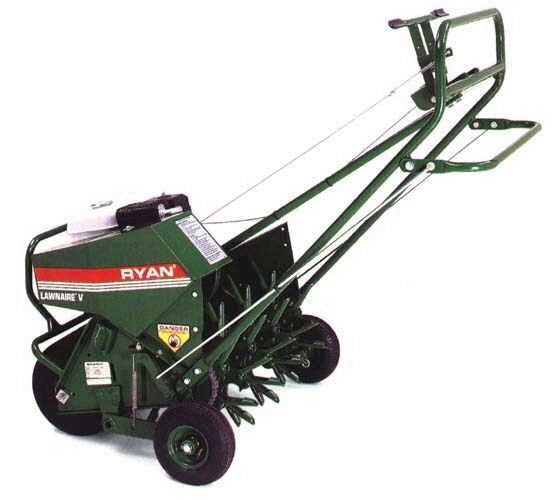 AERATORS ARE DESIGNED TO PULL A PLUG/CORE OF EARTH OUT. BY REMOVING A CORE IT ALLOWS OXYGEN AND NUTRIENTS TO GET TO THE ROOT OF THE GRASS. THE CORE SHOULD BE NO LONGER THAN 2 INCHES IN DEPTH. IF THE DEPTH IS SET ANY LOWER THE MACHINE WILL BE DAMAGED. DAMAGES ARE CUSTOMERS RESPONSIBILTY. * Please call us with any questions about our aerator 30 inch core walk behind rentals in Flemington NJ, Somerville, Flagtown, Frenchtown and Western New Jersey.